First published in Volume 4, "The Dove," of Our Song Birds, a quarterly magazine published in 1866 by Root and Cady, Chicago. This is the first version of the song as published in October, 1866. Ho for the little ones, Christmas joys. O! O! O! Who wouldn’t go. Upon the housetop, click! click! click! Down thro’ the chimney with good St. Nick. Whistle and whirligig, whip that cracks. What will the good Saint do for him? There, he is adding a new ratan! Shaking a rattle, now bless his heart. Haven't they tossed you an extra bone? Now waga "thank'ee" to Santa Claus. 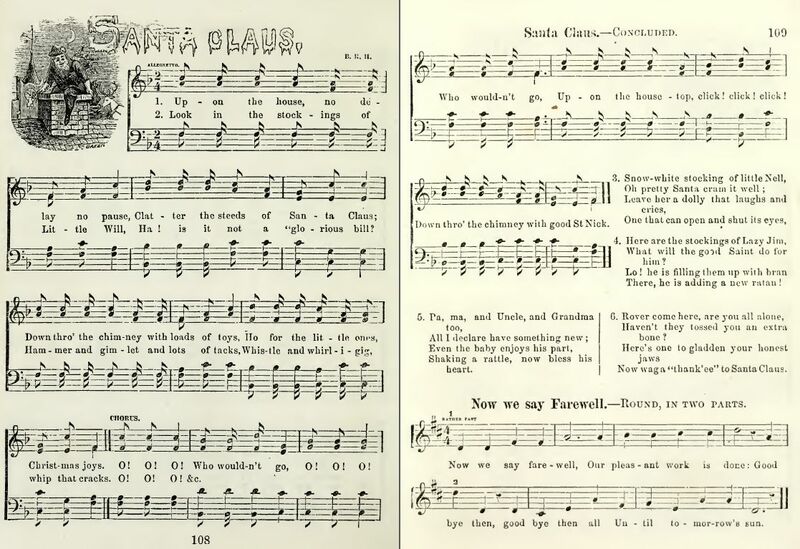 The original Sheet Music, "Santa Claus," by Benjamin R. Hanby from Chapel Gems for Sunday Schools; Selected from "Our Song Birds" for 1866 (Chicago: Root & Cady, 1866), pp. 108-109. Note: An additional musical setting can be found in Roy Ringwald's Book Of American Carols (2004). 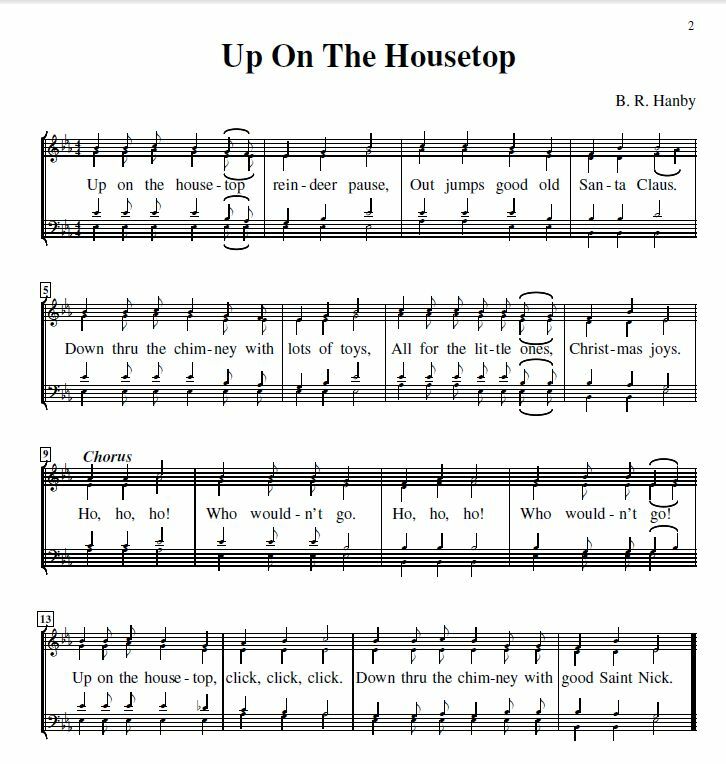 Sheet Music Up_On_The_Housetop sequenced by Douglas D. Anderson from A Victorian Carol Book (2006), p. 75, used with permission. The year 1864 was a difficult one for the young minister. Ben Hanby, son of Bishop William Hanby, was struggling. Because of his views on music in church services, the teaching of children, and his opposition to slavery, his pastoral experience had been very difficult. Indeed, he resigned from his second church in this year, and was struggling to make a living for his wife and two children by running a singing school, and also writing music for the John Church Music Publishing company. In his lifetime he would publish over 80 songs. "Santa Claus May Be Recognized"
Upon the house top, click! click! click! Two additional stanzas were added by "Paulina" (verses 4 and 5 above), and all six were published in October, 1866 in Issue 4, "The Dove," of the quarterly magazine "Our Song Birds," edited by Hanby and published by Root and Cady of Chicago. It's original title was "Santa Claus." The song was then included in a compilation by Root and Hanby, Chapel Gems for Sunday Schools; Selected from "Our Song Birds," for 1866 (Chicago: Root & Cady, 1866), pp. 108-109; the sheet music is above. "Paulina" has been identified by some as Sophia Taylor Griswold, a prolific writer of hymns, and who wrote the lyrics to music composed by Philip Bliss and George Root. Hymntime has a long list of hymns written by her; see: S.T. Griswold. It was republished the following year by Root and Cady, and also by the John Church music company. Sadly, Ben Hanby had died in early 1867 of tuberculosis, prior to the republication of his song. The circumstances surrounding the creation of this song are found in an article by Pamela Allen, Site Manager, Hanby House Historic Site, "Benjamin Hanby composed ' Up On The Housetop.' " The Winter, 2015, issue of the Westerville Historical Society reproduced an interesting article from 1941 by Hanby family biographer Dacia C. Shoemaker, "Story of Christmas Song Appears for First Time." All for the little ones, Christmas joys. Ho, ho, ho! Who wouldn’t go. Up on the housetop, click, click, click. Down thru the chimney with good Saint Nick. In his brief life — he was just 33 when he died — Hanby wrote over 80 songs, including a Christmas Hymn, Who Is He In Yonder Stall. "Up on the Housetop" may well have been the first American song of importance which elaborates on the theme on Santa Claus. It also is one of the first entirely secular Christmas songs composed in the Unite States. Written by little-known Benjamin R. Hanby (1833-1867), sometime in the 1850s or 1860s , and probably in Ohio, this vivacious song could possibly predate the early secular classic, "Jingle Bells" (1857). The best estimate, though, is that Hanby's song was created in the 1860s. Hanby's life was short, less than 35 years. Yet he did manage to contribute this bouncy song, which is an especial favorite of children, to the enduring literature of the holiday. Furthermore, he may possibly have composed another popular carol, "Jolly Old St Nicholas" which is of roughly the same period and which has a suspiciously similar style of music and lyrics. There is absolutely no evidence that Hanby was responsible for the other song, yet the chronological and stylistic coincidences, plus the total anonymity of "Jolly Old Saint Nicholas," do elicit the conjecture that Hanby might have authored both songs. At the least, Hanby's "Up on the Housetop" may have influenced "Jolly Old Saint Nicholas." "Jolly Old Saint Nicholas" was written by Emily Huntington Miller, and published in "The Little Corporal Magazine" in December, 1865. Clement Clarke Moore’s poem, "A Visit From St. Nicholas," written in 1822 and now more familiarly known by its first line, "’Twas the night before Christmas," clarified for many children and their parents the exact fashion in which Santa Claus paid his visits – what he looked like, what the names of his reindeer were, how he got himself down the chimney. "Up on the Housetop," which was written in the mid-19th century by an Ohioan, Benjamin Russell Hanby, probably owes something to "A Visit From St. Nicholas," since no one before Moore had suggested that Santa’s sleigh could land on a rooftop at all.